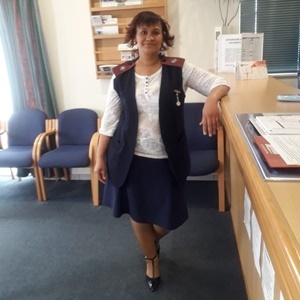 When two Eastern Cape-based patients urgently needed to be taken to Cape Town for life-saving transplant surgeries, there was only one person for the job. That's when Sister Salome Siebritz got the call: "Sister, your child needs you now. I know you’ll make a plan." “My colleagues all address me as ‘ma’. Whenever someone has a problem, I always make it mine. It’s just who I am. I’m very close to my patients; I will go out of my way to help them,” Sister Salome Siebritz tells us. Last month, Siebritz took it upon herself to drive two kidney transplant patients through the night from Port Elizabeth to Cape Town, arriving just in time for them to receive their life-saving surgeries. It was around 18:00, after arriving home from work one evening last month, that Siebritz got the call that one of her patients, 29-year-old Cally Williams, was eligible for a kidney transplant. Siebritz is a National Renal Care (NRC) nurse providing acute dialysis to patients in Port Elizabeth hospitals. She has known Cally for almost eight years, so naturally her family got to know about her as well. When Cally relayed the news to everyone at home, their excitement heightened alongside hers. But that excitement was soon dampened – the last flight from Port Elizabeth to Cape Town had taken off minutes after the patients were contacted. That’s when Siebritz decided to drive 800km through the night in order to make it on time for the transplants to take place. The expense of the trip was more than adequately covered after one of Siebritz’s colleagues posted a fundraising appeal on social media. Cally’s aunt, Mercia Williams, joined them on the journey and shared the driving. The patients eventually passed out in the back seat, but fortunately Siebritz and Mercia were too excited to even think about sleep. While the drive itself wasn’t stressful, Siebritz recalls the rush of the Cape Town traffic early the next morning when they arrived in the city. Alexia Michaelides, one of Netcare’s transplant coordinators, guided Siebritz and Mercia all the way to the entrance of Christiaan Barnard Hospital and even had breakfast organised for the ladies when they arrived at the hospital. Siebritz couldn’t have been more grateful. “When Cally was taken in to be prepared for the transplant, I felt at ease,” says Siebritz, adding, “And that’s when the tiredness hit me. It was so hectic that day. Siebritz laughs when I ask her how long the transplant took. "My job isn’t stressful. I love people,” she says. “Your attitude about your job depends on how you approach your patients. Sometimes they’re having an off-day and you need to step up and lift their spirits. Yes, the practicalities of nursing do not come easy, and it requires a ton of patience. Sometimes, in the midst of an unavoidable cacophony, it’s best to just remain calm," she tells us. “A fifteen-minute chat with someone who enters in a sad mood can make all the difference in the feeling they experience for the duration of their day. It makes a 4–5 hour treatment process a little bit more tolerable,” she says. For some, nursing is a calling right from the beginning, but for Siebritz it only came after the birth of her son. “I went through a few career possibilities and even worked in a factory at one point, but the desire to help others was always a factor.” She knew for certain that she wanted a career that required one to have a good dose of empathy and compassion. Before Siebritz got the call that night, a care worker at the unit was trying to figure out how to get Cally to the hospital. When Siebritz came to mind, she immediately contacted her. Two patients from Port Elizabeth were recently rushed to Cape Town to receive long-awaited kidney transplants – by a nurse who drove through the night to get them to their surgeries on time. US surgeons have made a huge breakthrough which could potentially make donor organs more widely available to patients infected with the AIDS virus, by performing the world's first kidney transplant in which both the living donor and the recipient are HIV-positive.